January 12, 5:00 - 8:00 p.m.
"INAUGURAL PAC MEMBERS JURIED EXHIBITION"
November 11, 5:00 - 7:00 p.m.
"THE NEUW POLITIC: ARTISTS EXPLORE"
April 1, 2017, 5:00 - 7:00 p.m.
January 21 - February 18, 2017. January 21, 2017, 5:00 - 8:00 p.m.
"WILD PLACES IN URBAN SPACES"
Artiszen Cultural Arts Center, Vallejo, CA. September 9 - October 9, 2016. September 9, 2016, 5:00 -7:00 p.m.
*This exhibition (which includes a specific commission of each artist by the US Forestry Service) has been juried by a committee made up of members of the US Forestry Service and others as part of the "Visions of the Wild Festival." The Healdsburg Center for the Arts, Healdsburg, CA. July 23rd, 2016, 5:00 -7:00 p.m.
"The Zeitgeist Exhibition – Capturing the Times Through Art"
the Petaluma Arts Center, Petaluma, CA. May 14, 2016, 5:00 -7:00 p.m.
A juried show in which dozens of artists examine the environments we live and thrive in and how they shape our lives. Reception: Nov 22 at 6pm. Kathryn St. Clair will have four paintings hanging at The Infinity Towers in San Francisco through December 1, 2014. For inquiries and private viewings, contact Matt Mckinley: info@mckinleyartsolutions.com or call 415.902.9863. A National Juried Show at the MARIN SOCIETY OF ARTISTS. Kathryn St. Clair will have two paintings featured in the upcoming edition of Studio Visit Magazine to be published in spring of 2014. 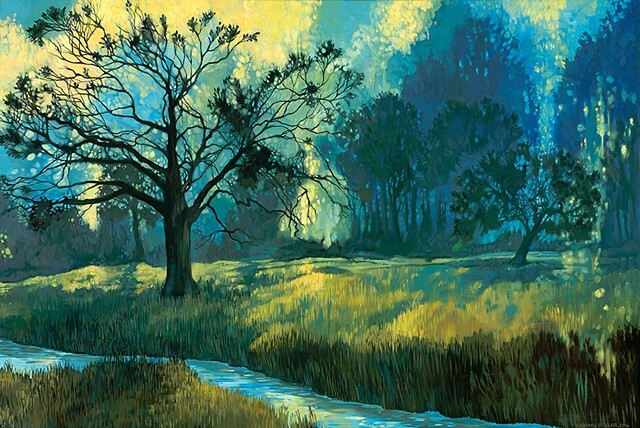 The Stanford University Medical Center recently purchased Kathryn St. Clair's painting, "Abstracted Wetlands," for their Hoover Hospital in 2014. The SFMOMA Artists Gallery at Fort Mason is an incredible non-profit gallery affiliated with one of the most dynamic modern and contemporary art museums in the United States. The gallery is both a reputable and affordable way to enjoy original works of art, and remains a critical resource for the entire arts community. Their exhibitions provide the San Francisco arts community with an incredible array of insightful exhibitions to view, and over twelve hundred emerging, mid career and fully acomplished artists a space to exhibit their work. 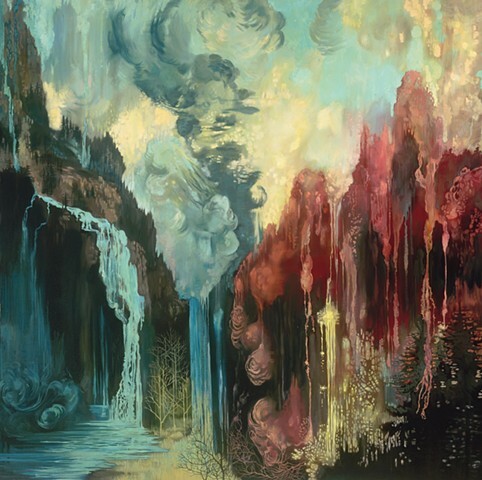 This past Thursday the SFMOMA Artists Gallery opened their group exhibition with Mirang Wonne, Jenn Shifflet, and Kathryn St Clair: three local artists who interpret the term landscape very differently in various media. 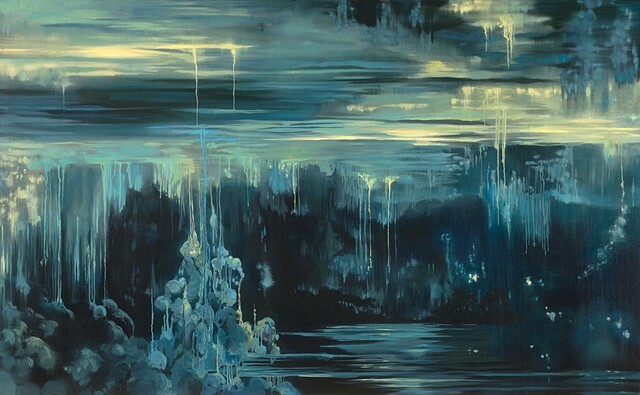 There is a definite delicacy to Mirang Wonne‘s artwork, but only at the surface. Wonne’s stain-less steel mesh banners float down from the ceiling, creating a ghost-like presence in the gallery, but their coloring and deft draftsmanship of bursting abstractions similar to chrysanthemums made by a torch create strong statements of beauty and demand an engagement with its viewer. 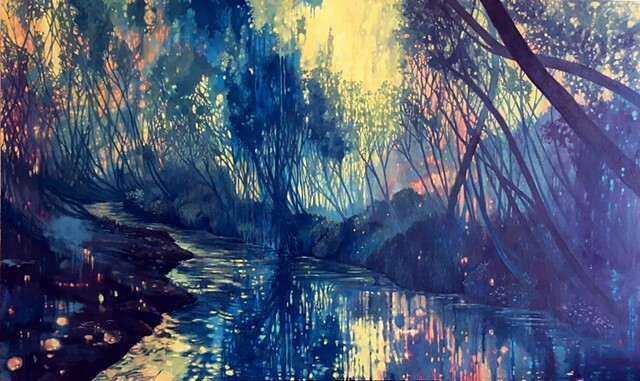 Jenn Shifflet‘s paintings create fantastic landscapes using only a slight array of oils on panel. They could be interpreted a variety of ways: adapting the undulating cloud patterns found abundantly in traditional Asian art, with what I see as the modern fantasy Asian pop-art connotations, they could be interpreted as cloudscapes, abstractions of stardust and other nuances of a dreamscape, ripples on the surface of a pond, or simply powerful interpretations of a conglomeration of them all. Kathryn St Clair also paints deceptively placid figurative landscape designs, mostly waterscapes amid verdant forests. 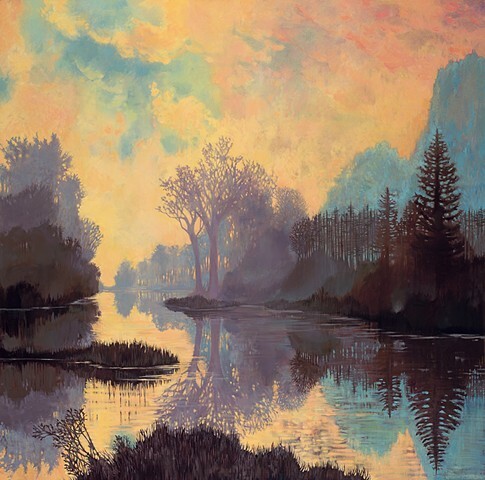 Any notion of safe subject matter is upthrown with her non-traditional color palette of oranges, purples and fuschias, her texture and abstraction of the skies, and the swampy, dripping spots of atypical colors and soft, but not quite accurate reflections in the landscape, capturing that moment before abstraction. When combined with her use of silhouettes, similar to the early arts and crafts modernism of the 1920s, it truly brings her artwork to a level of great significance.